HEA 410 Social Marketing and Advocacy in Public Health students spent the day in Frankfort meeting with their elected officials. A great opportunity for our students to learn about the process of advocacy for public health initiatives. 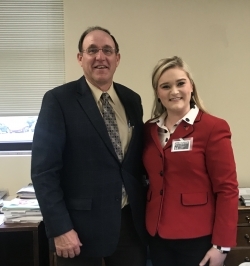 Sadie Harriis is pictured with Representative Stewart, who agreed to cosign one of the bills we were advocating for- water bottle filling stations in new construction K-12 schools.